Rendering of police funeral honors demonstrates gratitude to those served and protected their communities. This ceremonial paying of respect is the final demonstration that can be provided to the officers' families. Police honors funerals are quite similar to those of the military. Honors are usually applied to officers killed in the line of duty and those who are retired from law enforcement. Protocols slightly differ from community to community and are completely subject to the family's wishes. Generally what can be expected for a line-of-duty death (LODD) is a large law enforcement presence at the service and graveside ceremony. Many will probably be from bordering states, though I have witnessed officers from as far away as Canada attend funerals in Memphis. As a result, arrangements for the funeral service usually take place at a church/facility large enough to accommodate the number of attendees. For retirees, there is usually a smaller contingent of officers, though many departments provide full honors depending on their protocols. Much of the funeral details are handled by a Police Honor Guard. The Guard is responsible for co-ordinating and directing activities, the Casket Watch, flag bearers, pallbearers, rifle salute, bugler, bagpipes, and flag folding/presentation. A Casket Watch is staffed by uniformed police officers and is often comprised of officers from the Honor Guard. 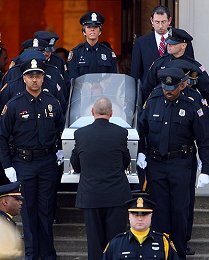 The Watch takes place from the arrival of the deceased officer's casket until the end of the funeral service. Two uniformed officers position themselves at opposite ends of the casket. A Watch is divided into shifts of 15-30 minutes. At the funeral service's end, a command is given by the Honor Guard commander. That's a signal for me to starting piping. Usually I lead the casket out, followed by the Honor Guard, from the church to the awaiting hearse. Almost always this is the only piping performed during the funeral service. For a LODD, the procession to the cemetery is lengthy. It can be comprised of literally hundreds of police vehicles and overhead helicopters, and news services. The Memphis Police Department offers a flyover to coincide with the graveside service. Colors are brought to graveside and usually preceded by the piper performing an appropriate tune. When the graveside service is ready to proceed, it will not be lengthy. By this time, hours will have elapsed since the initial service began. Typically this portion will be no different than a civilian service of the same faith. After the officiant has finished, the following occur: a rifle salute, playing of Taps, flag folding/presentation, and final bagpipes performance. Amazing Grace is the most requested. Copyright ©2019 - J. Stephen Sanders.